The Monaco Grand Prix has established itself as the most exciting event on the F1 calendar; a fierce competition in which the world’s greatest drivers battle it out on the Principality’s streets for a place on the podium. The Monaco Grand Prix is one of the most eagerly anticipated events in the Formula One calendar. The prestigious race has a long and rich history which started in 1929. Its reputation and popularity have just continued to go along with the prestige of the city-state. Fortunately, you don’t need to be a huge fan of motorsports to enjoy the occasion, since the glamour and excitement of the event is an amazing experience in itself. It’s the perfect opportunity to indulge in a luxury car rental in Monaco. Monaco’s illustrious race isn’t only famous for its magnificent location and air of exclusivity. It is also considered the ultimate test of driving skills and the one race that all drivers dream of winning. It’s the most technically demanding of all the circuits on the Formula 1 World Championship tour. The track is laid out on the streets of Monte Carlo and La Condamine and features narrow roads with lots of tight corners. A significant part of the 3.34 km track runs along Port Hercule, Monaco’s scenic main harbour where spectators watch from the decks of superyachts. Renting a supercar in Monaco allows you to drive these legendary streets for yourself after the race and experience what the drivers felt, albeit at a slower speed. There’s really nothing quite like cruising around La Condamine in a drop-top Lamborghini, rolling up to Casino Square in Porsche or gliding through the tunnel in a Ferrari. Possibly the most famous street circuit in the world, the Monaco Grand Prix takes place on real roads, designed for road cars that have been closed to the public. The streets are lined with unforgiving barriers and the fact that they are the slowest ones of the F1 season doesn’t make them any less treacherous. They feature plenty of pulse-raising twists and turns and their narrow width makes overtaking extremely difficult. One of the most hair-raising moments is when the cars speed through a tunnel and emerge just before a chicane, with the contrast of darkness and bright sunlight proving to be a huge challenge to the driver’s vision. The braking zone offers a rare opportunity to pass, which hasn’t always ended well for even the most experienced drivers. The first two practice runs for the 75th Grand Prix begin on Thursday 25th May. The third and final F1 practice runs resume on Saturday morning from 11am and qualifying takes place between 2pm and 3pm in the afternoon. Sunday is when the majority of the action happens, with the F1 track parade beginning at 12.30pm and the Grand Prix 2016 itself beginning at 2pm. The atmosphere is usually electric by this point and the whole weekend has a celebratory feeling with parties both on and off shore and on luxury yachts. There are several areas for spectators to watch proceedings. 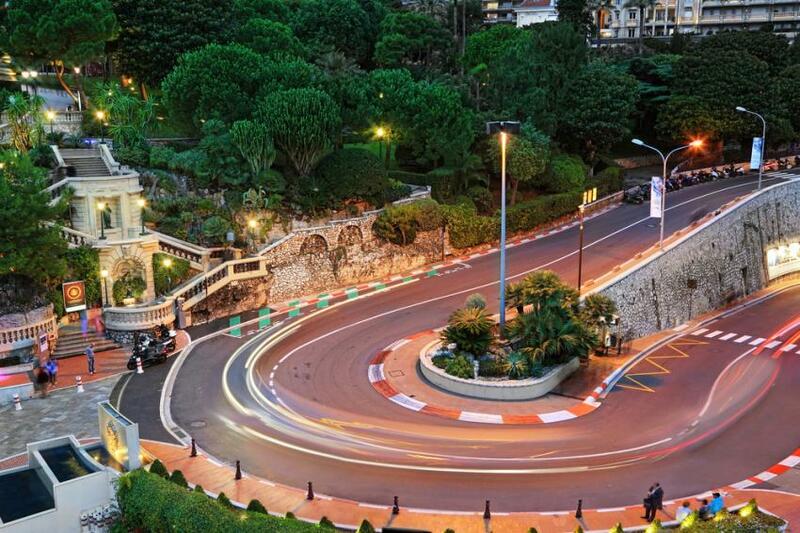 Perhaps the most popular choice is Casino Square where the decadent Monte Carlo Casino provides the backdrop for one of the circuit’s renowned hairpin bends. Tabac Corner, a 155km/h left-hand turn overlooking the harbour is also a well-regarded position. Both areas have large screens where the race is broadcast live. For those who want to view the race in opulent surroundings being served champagne and canapes, reserve a place at one of the hotels or restaurants with track views such as the Hotel de Paris and the Fairmont. The Ermanno Palace Penthouse has been dubbed the ‘Best view of the Monaco Grand Prix’ since it presides over a panorama of the start/finish straight and pit lane exit, Sainte Devote, Casino Square, the harbour front and Piscine. Although, the event itself is about much more than just racing. For the Grand Prix 2016, Monaco will also welcome luxury yachts carrying the social elite as they flock to the Cote d’Azur for the festivities. As a result, the social scene blossoms with parties up and down the coast, and what better way to arrive than in a luxury car rental? Not only is a prestige car rental perfect for the Grand Prix, but the timing allows you to explore more of the Riviera in style as the summer season starts. If you would like more information about renting a luxury car for the Monaco Grand Prix, please contact our friendly team.